Line a 10-inch by 15-inch baking pan with non-stick or regular tin foil. Butter tin foil well. Sprinkle on half of the yellow sugar, covering the bottom and sides. Pour 1/2 cup of the water into the bowl of a stand mixer. Stir in gelatin. Let bloom (gelatin will soak into the water and soften). Pour remaining water, sugar, corn syrup, and pinch of salt into a saucepan. Turn heat on medium, put lid on pot, and heat for four minutes. Remove lid, attach candy thermometer to pan, boil without stirring until syrup reaches 240°F. Once syrup is mixed into the gelatin, increase mixer speed to medium for a minute or two. Then increase speed to high and mix until bright white, light and fluffy, and fairly cool. This will take between 10-15 minutes. Pour marshmallow into sugar coated baking pan. Spread evenly. Sprinkle yellow sugar over top of marshmallow. Allow to cool for at least an hour. Butter the inside and outside of a 1 1/2-inch by 2 1/2-inch metal egg-shaped cookie cutter. Cut out 48 marshmallow eggs. Roll edges of cut eggs in more yellow sugar. To each egg, attach 2 candy eyes and one golden orange diamond shaped sprinkle (beak) using cookie icing. If desired, you may use cookie icing to make the chicks look like they are popping out of a cracked egg shell. *If you can't find yellow colored sugar, you can make your own. Pour 2 cups white sugar in a zip-top bag, add a few squirts of yellow food coloring, and shake until sugar turns yellow. 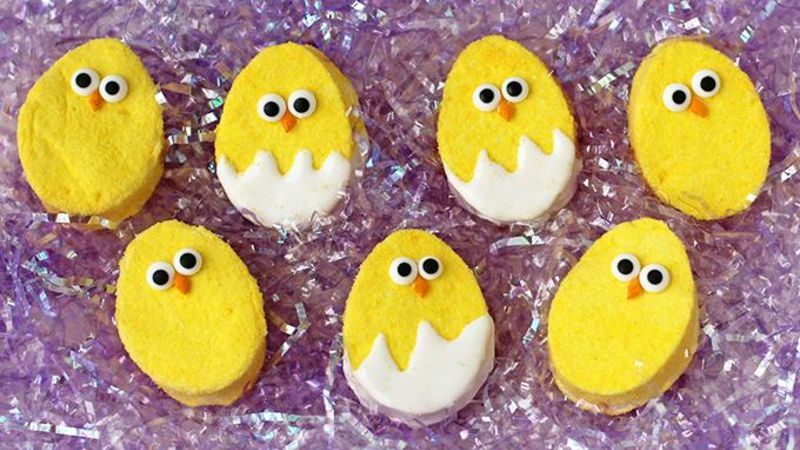 Delicious and easy to make, marshmallow chicks you can make at home are a fun and creative way to make an Easter basket extra special. My Easter basket was always filled with jellybeans, a chocolate bunny, and marshmallow chicks. As an adult I still can't make it through the season without buying a package of sugar coated marshmallows. Recently I discovered that I could easily make my own marshmallows at home and decorate them in festive ways for any holiday. Homemade marshmallows have a wonderfully light and fluffy texture that melts in your mouth and a lovely vanilla flavor. If you prefer, you can even use flavored oils and extracts to make lemon, banana, orange, cherry or even cola-flavored marshmallows. In order to make the perfect homemade marshmallows you must have a few specific kitchen tools. A candy thermometer is essential, as you need to monitor the temperature of boiling sugar syrup and pull it off the stove at just the right time. The other piece of equipment is a stand mixer. I've burned out motors in hand held mixers making marshmallows, so unless yours is exceptionally powerful, I recommend a stand mixer with a nice big bowl. If you have those two things, then making marshmallows is really quite easy, and decorating them for Easter is so much fun! To start, you want to line a 10-inch by 15-inch baking sheet with non-stick or regular tin foil. Butter the foil well and sprinkle it liberally with yellow decorating sugar. If you can't find yellow sugar, you can make your own. Just pour white granulated sugar in a large zip-top bag, add a few squirts of yellow food coloring, and shake until the sugar turns yellow. To make the marshmallows you need to bloom some gelatin. That simply means sprinkling it over some cold water and letting it soften for about 5 minutes. I usually just bloom my gelatin in the bowl of my stand mixer. Next up, boil the sugar syrup. Start by giving your sugar, corn syrup, water and salt a little gentle stir, then put the lid on the pot, bring it to a boil, remove the lid and just wait until it reaches 240ºF. You don't have to sit over a hot pot and stir. It's great! Once the syrup has reached that temperature, carefully pour it into the bloomed gelatin. Turn your mixer on low, and slowly drizzle the syrup into the bowl. I usually wear oven mitts just in case any of that boiling sugar syrup spatters out of the mixer. Now all you have to do is turn the mixer up to medium for a minute or two then up to high and walk away for a while. About 10-15 minutes later your marshmallow will be bright white and light and fluffy. You can add some flavoring now. The recipe calls for vanilla, but you can get creative and use any extract or flavored oil you'd like. If you use flavored oils, add about a 1/4 of a teaspoon, and then taste it. Add more if needed. The marshmallow is ready when it has cooled to barely warm. Pour the marshmallow onto the sugar coated baking pan. I find it very helpful to butter both sides of a rubber spatula or a plastic bench scraper to do this job. Spread it out as well as you can. I actually put on a pair of food handling gloves, buttered them well, and then used my hands to flatten the marshmallow in the pan. Sprinkle lots of yellow sugar over the top of the marshmallow and walk away. About an hour later your marshmallows will be ready to cut using a buttered metal egg cutter. The sides of the marshmallow eggs will be sticky, so roll them in some yellow sugar. If you're using a 1 1/2-inch by 2 1/2-inch cutter like I did, you'll get 48 marshmallows out of a batch, plus lots of scraps to snack on. Now comes the fun part; you get to decorate those yellow eggs to look like adorable chicks! If you want to keep things simple, attach two candy eyes and one golden orange diamond shaped sprinkle to each egg using Betty Crocker Cookie Icing. For a more detailed look, pipe on a cracked egg using more icing. If you want, you can put the marshmallow chicks on lollipop sticks, just make sure you do it while the icing is still wet, or better yet, before you ice them. If you wait and try to add the stick once the icing has hardened you'll get cracked eggs. I piled my Marshmallow Chick Pops up on a plate and sold them at a bake sale. They were a huge hit. And they’ll be a huge hit with your friends and family when they discover adorable, delicious marshmallow chicks in their Easter baskets!